Below is several pictures of our uncles who risk their lives, to rescue those who were oppressed by Nazi regime and were a threat to the world. Here’s a brief summary from novelette, Wherever You Go written by Martha Turkstra- Tigchelaar on page 41, “These were days of great anxiety on the home front, for our parents and our church. Our concern was for boys as dad and mom lovingly called them. Needless to say, many prayers went up for each one of them.” Further on page 43, “on May 4th and 5th, 1945 the Germans finally withdrew the troops. Uncle Wilfred travel throughout Holland. That was time of great rejoicing for our family in Holland, to actually hear, to touch and see a Turkstra clan in a Canadian uniform. Many Canadians have fallen in the battle to free Holland, and thousands lay buried there. This was truly amazing. Hedser Turkstra, a cousin, told Wilford that Dad’s debt to his family – incurred years earlier to make the move to Canada – was now settled because three of his sons had joined in the fight to free Holland.” When see see poppy remember the vets!! On my desk top is a Picture of several medics recusing wounded solders out of harm way. One of them is my uncle. “Elí, Elí, lemá sabachtháni?My God, My God, why have You forsaken Me? I will never leave you or forsake you. The Lord is my helper, I will not be afraid. Yet, God is not, or idly sitting by or isn’t incapacitated of stepping to assist His own God is still sovereign. While the curse of sin is the cause and effect of suffering, However, He uses suffering as tool for his sovereign purposes. To build character and strengthen the saints in times of trouble waters when declaring the gospel. If only Son Jesus Christ was called to suffer shouldn’t His follower bear his scars as well when testifying about Jesus Christ atoning works. It was effective tool against the lost. For example, when Jesus uttered these words.“ Elí, Elí, lemá sabachtháni? My God, My God, why have You forsaken Me?” In that moment of time all of mankind sins fell upon Him, and His Father wrath fell upon Him as well. In short, He made Jesus who did not know sin to become sin to mankind. So that, we will become the righteousness of God through Jesus Christ. When the saints testify Christ atoning works to the non believer, and when they persecute saints. They remember Jesus endured on the account because theirs sins. Jesus went to Calgary Cross willingly. Or also known as Golgotha meaning a place of scull. Just on outskirt of Jerusalem. Where in span of twenty fours hours. He endured severals legal proceeding, mocking, beating, Hie closest friends desert Him and one betrayed while another denied Him three times. Along with two criminals where mocking Him, and His own Father deserts Him when He was enduring both physical and psychologic pain. When the curse of sins fell upon Him. When presenting the gospel either they accept it with a great delight since sin is like steel ball that hung around the person neck, and they’re set free or redeemed from the curse of sin, or they kill the messenger. For example, Steven the first martyr was stoned by enraged mob. Just before pass away he saw Jesus the Son of Man standing at the right hand of God! And uttered these words, “Lord Jesus, receive my spirit! “Lord, do not charge them with this sin! ;” Than he fell asleep. Or an example the apostle the Paul known as Saul while breathing threats against the follow of o Jesus encounter Jesus while on the road of Damascus.a light from heaven suddenly shone down around him. Suddenly, a light from heaven shone down around him. Jesus uttered these words, “Saul, Saul, why are you persecuting Me?” Paul said “ Who are You, Lord?” The voice said.“ I am Jesus, the One you are persecuting,” He replied. “But get up and go into the city, and you will be told what you must do.” Note Jesus never uttered these words, how dare you persecute me but go into the city, and you will be told what you must do. It reveal later that Saul would suffer for sake of gospel. For example,”Three times I was beaten with rods by the Romans. Once I was stoned by my enemies. Three times I was shipwrecked. I have spent a night and a day in the open sea. The blind beggar in the gospel John uttered these words concerning Jesus before Pharisees, “We know that God doesn’t listen to sinners, but if anyone is God-fearing and does His will, He listens to him. Throughout history, no one has ever heard of someone opening the eyes of a person born blind. If this man were not from God, He wouldn’t be able to do anything. After spoke these words Pharisee toss him out temple, and first person he encounter was Jesus. Jesus revealed him that was the Son of man, and believe him, and he began to worship Him. In short, they met Jesus, and it had effect on their lives, and committed to follow Him even into death. According to Foxe book of martyr prior to being burn at stake. A saint got on his knees before the stake, and thanks God that worthy to suffer in Jesus name. While other story and another saint took his the chain off. His fellow comrades were in shock fearing was he going to recant. He ensure them that he wouldn’t recant. He just wanted to Jesus face once more time. He saw Jesus the Son of Man standing at the right hand of God! He put the chains back on and went up with flames along with his follow comrades. Receiving his crown of martyrdom. 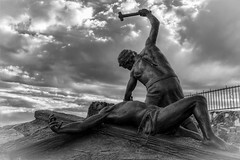 Yet, another saint will being tortured felt the initial excruciating pain of the torturer hand; however, soon after he saw a cross with Jesus on it. He was consoled and encouraged In which aided him to endure the agonizing pain of torturer hand. Roger Hope former papist named . In which he live a licentious, a lover of bad company. Where he has trust of his master he was entrusted thirty pound, and spend on gambling tables. Unable pay it back he went to a maid who had christian principle. A gave him a thirty pound note. With condition that abandon all lewd and vicious company; that you neither swear nor talk immodestly, and game no more. Furthermore attend the daily lecture at Allhallows ,and sermon at St Paul’s every Sunday. That you cast away all your books of popery, and in their place substitute the Testament and the Book of Service, and that you read the Scriptures in which he comply. Within half year he became a zealous professor of the gospel, and was an instrument of conversion to his father and others whom he visited in Lancashire, to their spiritual comfort and reformation from popery. When he, with six others was taken not far from St. John’s Wood, and brought to Newgate upon May-day, 1558. He was called before the bishop Dr. Chedsey. Even thou he expressed much affection for him, and that should he consider following popery and Roman Catholic Church doctrines. A practice that Roger once practice fervently. Where he utter these words, “I was apprenticed, that I was of your blind religion—that which now is taught, and that I obstinately and wilfully remained in it. I could for money have them absolved. Perhaps the words by Sergei Kourdakov a former KGB intelligence officer who persecuted the church in Russia and was very good at job afflicted as much terror on the Christian church in. Witness this account and wrote in his memoirs these words, “At last she gave in and began sobbing. When I was so exhausted I couldn’t raise my arm for even one more blow, and her backside was a mass of raw flesh, I pushed her off the table, and she collapsed on the floor.” It was the girl he was beating that later changed his life. On January 1, 1973, at the age of only twenty-two. Sergei was found dead in a hotel room. Shortly after publishing The Persecutor Sergei could not keep silent anymore. The Christian movement that he was attempting to eliminated. He willing died for sake of the gospel.